My daughter loves doing family theme costumes for Halloween. She even got her brother involved in this one. 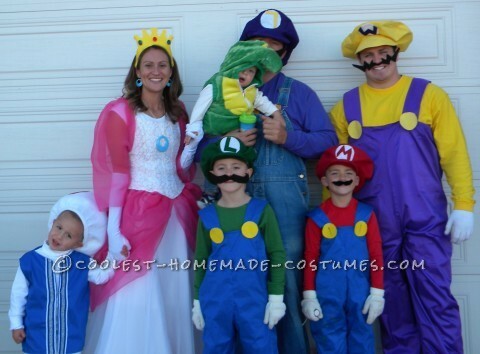 Mostly all of the costumes were homemade, including the Mario overalls and hats. Colored shirts to match the hats were worn as well as big yellow buttons and Mario mustaches (can be cut from paper or felt). The dress my daughter is wearing is an old prom dress that we added pink tulle to in order to create a Princess Peach costume. The toad costume was made a white long sleeve shirt and white sweat pants. The hat was made of white felt and big red dots. We made the vest with ribbon sewn in. The baby was Yoshi and wore a store bought alligator costume.